Jim Byers explores Grand Bend. I’ve spent many a day kicking down the streets of Lahaina on Maui. I’ve paraded down Duval Street in Key West and strolled the piers of California from San Diego to Santa Cruz. I’ve been lucky enough to hit the beaches of Thailand and Sardinia, of St. Lucia and Senegal. Yet somehow, despite some three decades living in Toronto, I’d missed spending any time in Grand Bend. It won’t happen again. Because there are few things I love more than a good beach town. And because Grand Bend might be the best beach town in Canada. It took me all of about two minutes to fall in love with this place. I pulled off Highway 21 and cruised under the giant “Grand Bend” sign, with its brilliant yellow sun, and spotted a great mix of options: sushi restaurants, t-shirt shops, a small mini-golf course and, the sure sign of a great beach town, casual spots selling the kind of French fries that smell like summer. The first store I walked into was Archies Surf Shop, which sells high-quality tees and sweats with simple but classic design. Some guys love a crisp Armani suit, but I love nothing more than a $25 tee shirt with a bold logo of a great beach destination. And I found lots to love at Archies. I had a kiddie-sized (hey, us travel reporters have to watch it on the road) vanilla-chocolate cone at Dairy Dip; the perfect snack on a summer’s day, and took pictures of brilliant white straw hats that were calling my name, despite my having two or three of them at home already that get little use. Then it was time to hit the beach on a warm, sunny afternoon. There were beach volleyball players galore and brightly coloured umbrellas on a warm stretch of sand. There were families, but being a weekday in mid-June a lot of the younger kids were still in school; leaving the beach to university-age kids long-since freed from the shackles of the classroom. I strolled past the pink, soft green and baby blue Muskoka chairs in front of the Bonnie Doone Manor and strolled out to the short cement pier to take photos of the beach. I snapped photos of boats on the Ausable River and then headed to my hotel. The tourism folks had booked me into the Pine Dale Inn, and I found it absolutely charming, with a great mix of things to do and quiet pockets to explore. Manager Mary Jo Schottroff tells me the Inn has been in the family for 36 years. She proudly shows off the indoor pool and whirlpool and escorts me to the quiet gardens in back of the units, where you’ll find a small, covered gazebo that’s perfect for reading or a mid-day snooze. The Inn backs onto the Ausable River, so it’s a great spot to watch turtles sun themselves on a rock or dip your line or just relax by the water’s edge. They also have a small pond out front with red and white Muskoka chairs. Other amenities include meeting rooms, a pool table, video games and gas barbeques; making it ideal for families who don’t want the expense of eating out all the time. Schottroff also will let you sign out of their entry permits for Pinery Provincial Park just down the road, thus saving you another $17 or so. They have motel-style units but my room was upstairs over the lobby, with tons of space and a fireplace and a set of chairs in front of the TV. It’s barely a 10-minute walk into town, or a very short drive, and they’re also pet-friendly. I sat down for dinner on the patio at Smackwater Jacks, a fine spot along the river with a full view of the sunset. Owner Brad Oke tells me he worked for Bell Canada, had a sting in Saudi Arabia and toiled as a builder for many years in the Grand Bend area. “Then I got stupid and opened a restaurant,” he says with a laugh. Over the course of a 90-minute dinner, Oke is pulled away several times to check on one of the TV’s showing the Women’s World Cup or to smooth over one of a million little things a restaurateur has to deal with every day. He stops to chat with folks at nearby tables, acting as something of an emcee or general host, which also goes with the territory. We have a smashing good time sipping local beers. The Smack Attack is made especially for him by Stratford Brewing Co. and all his staff have been trained in the world of beer so they can better dispense the goods from the restaurant’s 16 taps; mostly craft products and imports. We also dine on Thai chicken bites, slip our crackers into a rich and smooth dip with smoked bacon, cream cheese, garlic and Thai spices. My main course is an excellent local turkey filet from Hayter’s Farms. For dessert, he gets me to try special deep fried banana caramel cheesecake he hands out to folks celebrating a birthday. Yum. The restaurant seats 249 but only 75 spots are indoors, so Oke has to keep a close eye on the weather. He stays open in winter, partly so he can keep his workers employed year-round and build loyalty. Business isn’t as strong in the off-season, of course, so he adds special theme nights such as Mardi Gras Night or Cinco de Mayo. Oke realized that drinking and driving laws and societal change meant folks were reluctant to come to his place and have more than a beer or two, so he started a pickup service a few years ago, using an old ambulance. These days he’s got a bright orange, 1974 VW van that’s generously sprinkled with hippie photos that he uses to ferry folks to his restaurant from as far away as 30 km’s or more. Oke tells me he gets as much of his restaurant’s food from local producers as he can. He might someday even be able to serve local wine, as wineries are cropping up all along the Lake Huron shoreline. I drive a few miles south the next day and taste some fine cider from Twin Pines Orchards, which also has a lovely gift shop with great jams, hot sauce and home décor bits for the house or cottage. Dinner is over at a good time, so I scoot back to the Pine Dale Inn and grab my camera so I can catch a truly magical sunset on Lake Huron. The next morning it’s breakfast at The Schoolhouse Restaurant, a restored school with a quiet patio and lovely old photos of kids and teachers. I dine on lovely eggs, crispy potatoes (a critical ingredient of a good country breakfast) and homemade sausage and large, fluffy biscuits with good coffee. Owner/chef Gus Merkies, who makes everything from scratch, tells me he’s changed his menu over the years to adjust to changing times. “I was listening to the CBC a few years ago and somebody said something about ladies who lunch. I went to my restaurant that day and looked around at lunch and said, ‘Yeah, it’s 80 per cent women.’ So I added some new items to the menu, including quiche.” He’s also adding a gift shop in behind the restaurant, nestled in a small, green glen near a spot in the Ausable River where booze used to be smuggled during American Prohibition. It’s a charming spot that avoids being too cute or kitschy. As I’m leaving, Gus insists on giving me one of his cookbooks. A local hears us chatting and, after co-signing the cookbook with Merkies insists I visit her gallery on River Road in the afternoon. I’d been given a chance to try a jet ski session with Xtreme Watersports but opted instead to canoe the quiet waters of The Pinery Provincial Park on the shores of Lake Huron, just a few klicks south of Grand Bend. I don’t mind a jet ski now and then, but I par prefer dipping a paddle into still waters and gazing at brilliant white flowers on a deep green lily pad. After my canoeing I drive through thick forests of Oak Savannah and take a minute to explore some of the massive sand dunes on the shore of the lake. A fellow named Simon is on the beach, building a sort of teepee out of driftwood. “The natives used to do it, I’m told,” he said. “Folks like to come down here and build them. This one was falling apart a bit so I’m just helping fix it up.” I ask if it makes him feel part of something bigger and he smiles. “Yeah. It’s a nice thing to do.” I make my way back to Grand Bend around lunchtime and, as instructed by my new friend at the Schoolhouse Restaurant, check out the Castaway Gallery, next to Smackwater Jack’s. I’m hugely impressed by a variety of art on display; lovely photos of old barns in deeply emotional and almost ancient-looking browns, paintings of white sailboats on a neon blue lake, polished wooden bowls and sparkling beach glass jewelry. Eager to get to my next appointment on my tour of Southwest Ontario, I wander onto the patio at Midori for a quick bite of sushi. I’m expecting something fairly pedestrian but am served one of the lightest and tastiest tempura dishes I’ve ever had; with tiny sprigs of broccoli and slivers of red pepper and two homemade sauces for dipping. My sushi platter arrives with perfect tuna that’s lovingly presented with twists of lemon for decoration. The owner sends me out a gorgeous and intricate Kamikaze roll with salmon, avocado, cream cheese, cucumber, crab and a light tempura treatment. It’s rich and tasty and designed to look like a work of art from the Castaway Gallery. And I’m starting to think maybe Grand Bend isn’t just a great beach town. Grand Bend isn’t the only beautiful beach town in Ontario’s Southwest. Discover all 14 of our best beaches. 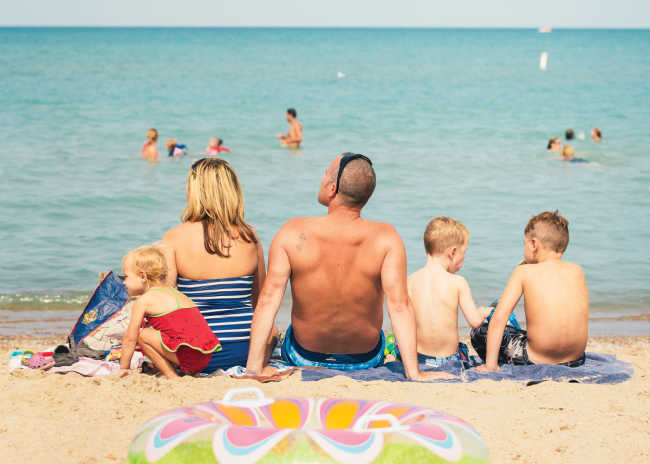 Be sure to find great summer offers for your next beach escape and enter to win our Best Beach Adventure for four on Lake Huron!